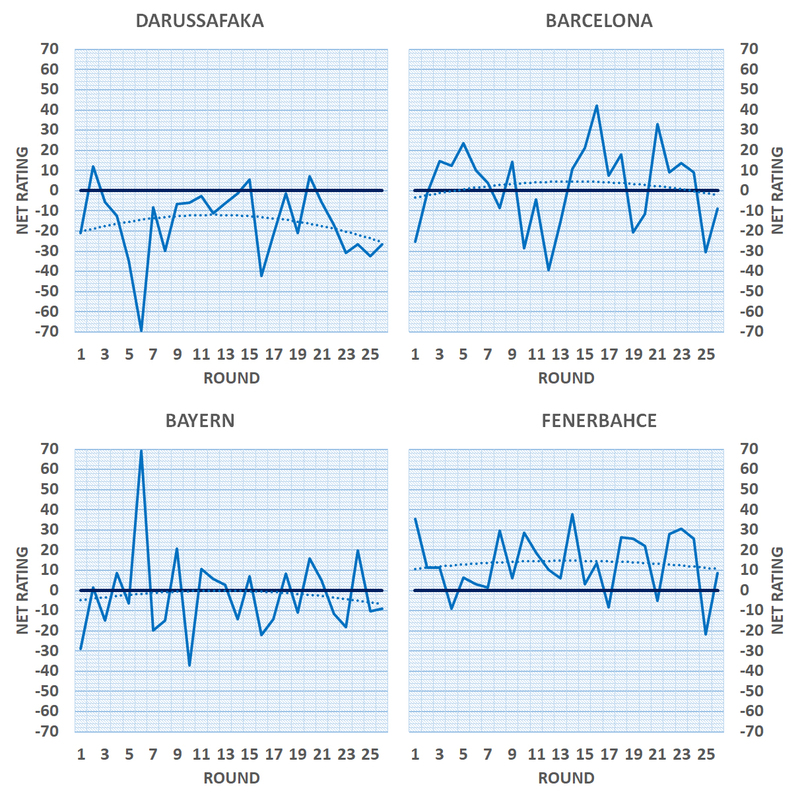 Let's see the Net Rating trend of the sixteen teams of Euroleague. Welcome back to Corner Stats! As we are approaching the end of the Euroleague regular season, I thought it would be interesting to observe the Net Rating trend of the various teams to take some consideration. The Net Rating is a statistic that is obtained from the difference between Offensive and Defensive Team Rating. The value of the individual game doesn’t give too much information but if you put the individual values in series, a chart comes out showing the performance and therefore the team condition. Efes’ trend has been constant throughout the entire season: as has been said several times, the Istanbul team is well built and plays a very modern basketball (in one of my previous articles I showed how the team is the most “Moreyball” Euroleague team). Different speech for Milan: the drop in the central part of the season has complicated its playoff race. Currently, Milan is seventh and it will have to face Panathinaikos in a sort of last chance game. 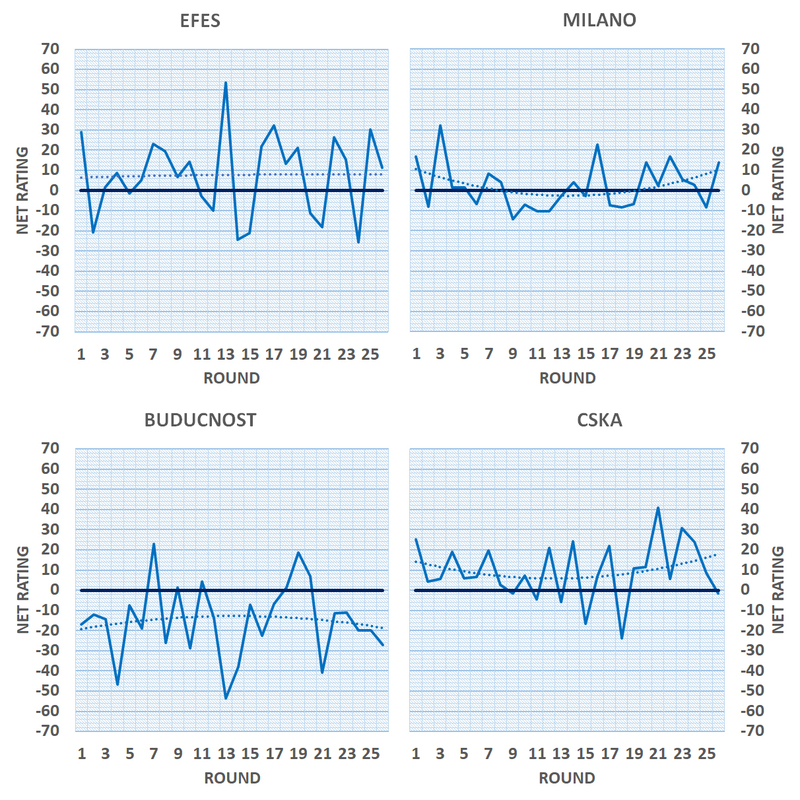 In the last four games, Milano will have very difficult games (Real, Fener, and Efes). We have to consider a sort of “satisfaction” factor for the two Turkish teams, given that they will be faced with a probably frozen ranking. Olimpia, therefore, has its own destiny in its hands, we will see how it will close the season. There is also Bayern among the contenders in the playoff place together with Milan; German team’s performance is almost the opposite of the Italian one; we can say that its chart also reflects the trend of the team within the game. Bayern is a well-built team, which has found in Derrick Williams’addition a determining factor for its season. However, Bayern’s attack is really inconstant. There are times when it’s really a pleasure to see them play and others where they totally freeze. The Khimki‘s chart shows instead a trend that raises some doubts against Shved: during his absence, Barzokas had found the chemistry to improve his players’offensive efficiency even without his star. This work had led to some victories, although not enough to be able to aspire to a playoff place. The sudden coaching change and Shved’s return coincide more or less with the trend drop phase: does this mean that Shved isn’t’a good player for the Russian team? I doubt it, but clearly, his return has forced Kurtinaitis to revise rotations and distribution of possessions and this has led to a new performance drop. 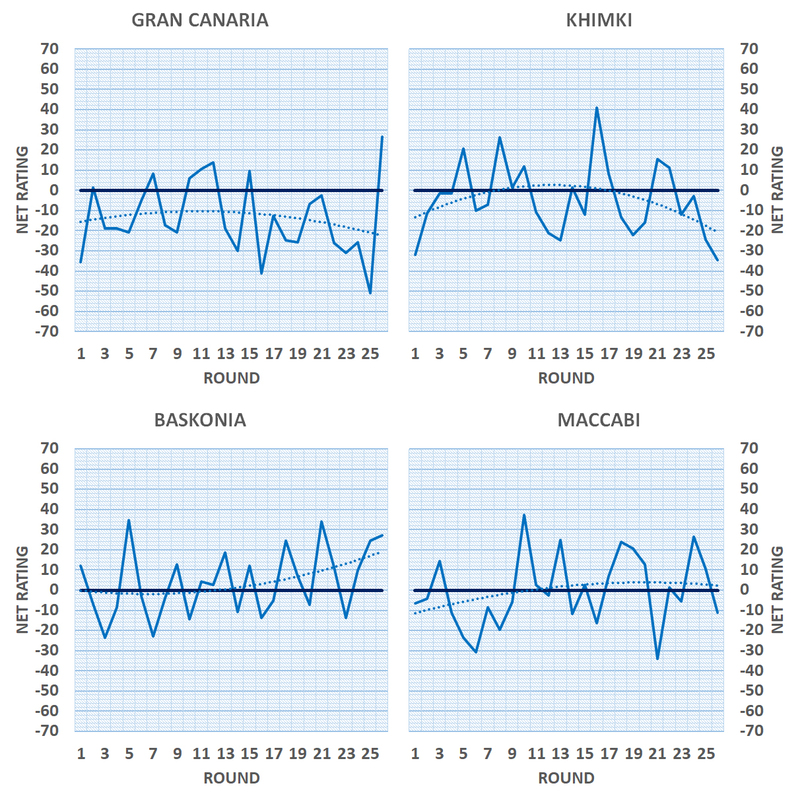 The Baskonia‘s chart has no sense: at the most critical moment of the season, without Shengelia, Granger and, recently, also Janning, Vitoria is grinding solid performances. While everyone thought that Baskonia would abdicate in the playoff race, Perasovic’s boys took several very important and decisive matches for the end of the season. Definitely surprising. Opposite charts for the two Greek teams: for Olympiacos, all the problems came out in a single moment. As already mentioned, the handler lack (the only two are William-Goss and Spanoulis) has created several problems for Blatt’s attack, especially since Spanoulis is clearly in decline and cannot guarantee the contributions he gave until 2/3 years ago. Weber‘s addition, as far as I have seen, has given something to Oly’s attack, but not enough because he doesn’t seem dangerous from behind the arc. Panathinaikos instead is showing various defects, but at least has found an organization that allows obtaining some important victories; Pana’attack depends a lot from its players’single performance but as far as we have seen, it is working and it remains in the running for a playoff place. In short, great season end awaits us, full of decisive and interesting matches.